Revolution Purple for dogs prevents heartworms, fleas and other harmful parasites. Why buy 4 different treatments for 4 different parasites, when you can prevent them all with a single medication? Whether you’ve got a Chihuahua, Yorkie, or Pomeranian their tiny tails will wag with vigorous joy after a single treatment rids them of all their parasitic woes. I don't see Revolution in the list of products when I click on the category for "Tick Control." Does it work for ticks, and if so, why isn't in the list of product choices under the "Tick" label? Revolution doesn't cover tick. It kills fleas and intestinal worms - inc. heartworm. I placed an order for Revolution purple (5-10lbs.) the puppy weighs more than 5 lbd. but is only about 7 weeks old. Is that safe for him or should I exchange it for the pink puppy? Thank you!!! I have a 8.5 week old border collie, she weighs 6.2lbs. She is quickly putting on weight so I assume this product would be the right product for her versus the puppy and kitten formula that only goes up to 5lbs. 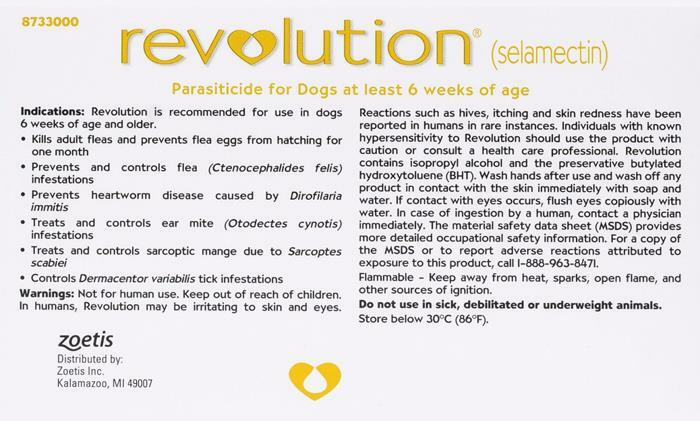 You can use this product safely on puppies older than 6 weeks. So yes this would be the product you should use. My dog is small at 10 lbs and a few ounces. Would I order the pack for dogs 11-22 pounds. I don't want to over medicate him. If he is a small breed this product should be good enough. But we always recommend to get advise from your Vet. Hello, I have a pomeranian and he is 9.1 pounds, should do 3 months auto delivery? If yes, than what happens when is goes over 10 pounds? Hi, We can always change the product to next size without any problem. I have used Revolution for my Baby Girl (Tinka) since she was 3 months old. After six years of using this product I am still very impressed with the results. Not one flee or tick not to meantion no ear mites or heart worms. Excellent. We were recommended to use revolution six years ago and have done so. Petbuckets has the best price. Love it, my little chihuahua has been on it since he was 1 years old. He is 8 now and it still works I use it every month. He is in good health no side effects. Thank You! Seems to be effective for our dog! Fantastic. Arrived on time. Revolution works perfect. Find a product that keeps away other bugs.